Firmware upgrade process for V5 Basic works based on built in usb bootloader. 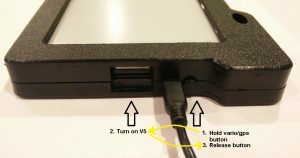 Vario/GPS board with connected USB cable and triggered bootloader will show up under PC as additional drive. Drive has limited capacity and will always show dummy firmware.bin file. We have to delete dummy firmware.bin file before copying new firmware file into vario/gps board. Name of the new firmware doesn’t matter, but it must have .bin extension. Also if we load wrong firmware into vario/gps board, nothing bad is going to happen. Vario/GPS board will not boot up and stay in bootloader mode. 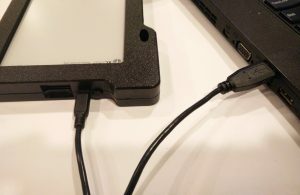 There are two microUSB ports available. One is native for ebook reader (used for battery charging, files uploads/downloads, flying app upgrade). Second microUSB port is located next to the vario volume/configuration button. 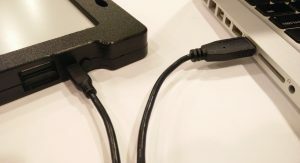 You can use PC, MAC or Android tablet (with usbotg cable) to establish connection with vario/gps board. Click picture to zoom and open in new window. Mac user interface (Finder file manager) handles files on external drives differently, and requires different approach. 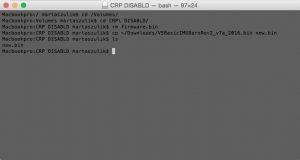 CRP_DISABLD drive is going to show under MAC, but deleting and copying new firmware file using drag and drop feauture will not work. File will be copied, but vario/gps board is not going to see the new firmware file. 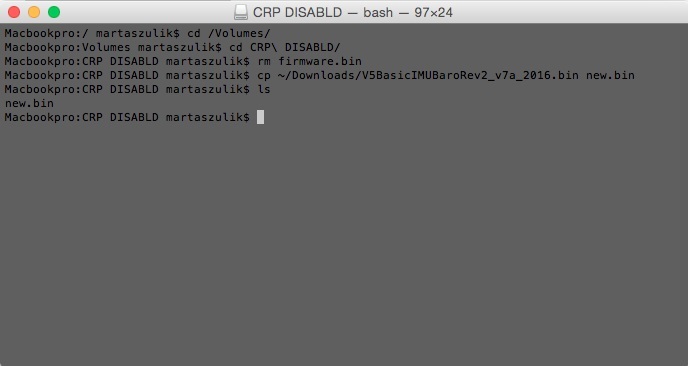 (this is because file is copied into higher CRP_DISABLD sectors). We are forced to use Terminal app and delete old firmware.bin file and copy new firmware file manually. I have notices on some PCs, MACs, that some apps (like antivirus apps, or drive managers for media files) are creating catalog files under any connected flash drive. Same happens with connected vario/gps CRP_DISABLD drive. If You notice that there are some other files created by windows or macos, please also delete them before copying new firmware file. Some microUSB cable have very short plug. If You are not able to trigger usb bootloader, check different usb cable. Vario/GPS when entering usb bootloader mode, will no beep, or make any sounds.